For the bicycle company, see Flying Pigeon. Pigeon racing requires a specific breed of pigeon bred for the sport, the Racing Homer. Competing pigeons are specially trained and conditioned for races that vary in distance for approximately 100 to 1000 kilometers. Despite these lengths, races can be won and lost by seconds, so many different timing and measuring devices have been developed. The traditional timing method involves rubber rings being placed into a specially designed clock, whereas a newer development uses RFID tags to record arrival time. While there is no definite proof, there are compelling reasons to think the sport of racing pigeons may go back at least as far as 220 AD or possibly earlier. The sport achieved a great deal of popularity in Belgium in the mid 19th century. The pigeon fanciers of Belgium were so taken with the hobby that they began to develop pigeons specially cultivated for fast flight and long endurance called Voyageurs. From Belgium the modern version of the sport and the Voyageurs which the Flemish fanciers developed spread to most parts of the world. Once quite popular, the sport has experienced a downturn in participants in some parts of the world in recent years, possibly due to the rising cost of living, aging fanciers, and a severe lack of public interest. Hypersensitivity pneumonitis is also a reason why some people leave the sport, which may cause irreversible lung disease in those with hypersensitivity to certain pigeon proteins. One recent development in the sport of pigeon racing is "one loft racing", where birds are raced against each other under the same training regime, from the same location.The principle being to find the best individual race bird irrespective of the race trainer. This will determine which bird is then the most successful. Racing pigeons are often transported in specially modified trucks. Pigeons are the oldest domesticated bird. The predecessors of modern-day racing pigeons were pigeons bred for their homing ability, primarily to carry messages. "Pigeon posts" have been established all over the world and while mainly used in the military, some are still in service today. Modern pigeon racing originated in Belgium in the mid 19th century. The sport was aided by several new technologies of the era. The advent of the railroad permitted pigeons to be sent to distant release points quickly and at modest cost. In addition the creation of mass-produced, sophisticated timing clocks brought accurate and secure timing to the sport. These clocks were designed with special compartments where an entry band, removed from the returning race bird was placed. When struck, the clock recorded the time and also placed the band in a compartment that could only be opened by race officials. The importance of homing pigeons in the centuries before electronic communications, such as the telegraph and telephone, is seldom recognised. However the Reuters News Agency, the world's largest information provider, began as a pigeon service carrying closing stock prices between Belgium and Germany, basically between the western and eastern terminus of the telegraph in Europe. Also the use of homing pigeons by financier Nathan Rothschild to gain advance news of Napoleon's unexpected defeat at Waterloo is thought to have led to a fortune being made in the bond market of the day. A fancier with racing pigeons. "It is the sport with a single starting gate and a thousand finish lines." In short, competing birds are taken from their lofts and must race home. The time taken and distance are recorded and the fastest bird is declared the winner. Races are generally between 100 and 1000 km in distance. In the United States flights of up to 1800 kilometres have been recorded. Provided it survives the many hazards associated with racing, a single pigeon could compete from about 6 months of age and still be in competition at over ten years of age. Such feats are uncommon, however, and the average racing career rarely exceeds three years. Hazards can also come from weather conditions on the day of the race. Pigeons can become grounded and disoriented, and therefore not finish the race. In one instance in Madison, Wisconsin, in 1941, a family found a pigeon on their property. Since the bird was sporting an identifying leg band, the Wisconsin Conservation Commission was called, who identified the owner as a man from Green Bay. In the early days of racing, paint was used to identify birds for owners. Belgium then developed a 1/8 inch brass leg band, that was sent to racers in America to use. Since then, to compete in a race, it must wear a permanent, unique numbered ring or band that is placed on its leg at about 5 days old. For a race to be conducted, the competing pigeons must be entered into the race, usually at the organisation's clubhouse, and taken away from their home to be released at a predetermined time and location. The distance between the bird's home loft and the racepoint is carefully measured by GPS and the time taken by the bird to return is measured using one of the two acceptable timing methods. Sometimes in some leagues there are two divisions: one for the young birds (usually yearlings in their first year of competition) and another for older birds. Some old style pigeon clocks use thimbles. The traditional method of timing racing pigeons involves rubber rings with unique identification numbers and a specially designed pigeon racing clock. The ring is attached around the bird's leg before being sent to race. The serial number is recorded, the clock is set and sealed, and the bird carries the ring home. When the first bird returns, its trainer removes the ring and places it in a slot in the clock. The time that the ring was placed in the clock is recorded as the official time that the competing bird arrived home. From this timestamp an average speed is measured and a winner of the race can be found. The pigeon's "official time" is not the actual time it arrived, it is the time the ring was removed, placed in the clock and recorded, which could be many vital seconds later. Exceptional pigeons may arrive home first on multiple occasions; knowing it is going to have the ring removed speedily, which may be uncomfortable, the pigeon could be reluctant to enter the loft for the trainer. The latest development and preferred method for timing racing pigeons is the Electronic Timing System. The bird's arrival is recorded automatically. When using an electronic system, the pigeon fancier doesn’t even have to be at the loft to clock the birds as they return. Birds are fitted with a band that has a tiny RFID chip in it which can be read when the bird comes home. At the home loft the electronic scanning records the pigeons arrival. The pad or antenna is placed at the entry point to the loft entrance and as the pigeon crosses it the electronic band is scanned. The clock is attached to the antennas. The serial number of the transponder ring is recorded along with the time of arrival. This is very similar to transponder timing systems used in human races. In February 2008 the members of the Penygraog Homing Society Racing Pigeon Club in Wales won an award to fund a new electronic timing device. The club was able to obtain the device thanks to funding from the All Wales award initiative. Club secretary John Williams said: "The electronic timer certainly makes it a lot easier for us". With the advent of electronic timing system recording birds’ arrival has never been easier. The ETS technology is developing year on year and it is taking over pigeon world, changing it and making it fit for today’s conditions. As a result of this new way of registering a bird’s arrival, several loft management software have been created in the last 10 years to help fanciers with record keeping, pigeon pedigree, publishing race results or keep track of treatment and vaccination records. One-loft racing is the process of training birds bred by many different breeders in the same loft, under the same trainer and in the same conditions (as opposed to trainer against trainer in their own lofts and usually with their own birds). It is thought to be the fairest method of proving which bloodline or breeder is best and usually provides the highest amount of prize money. Pigeons are recorded by electronic timing systems scanning the birds as they enter the home loft with winners decided by as little as 100th of a second. The birds are all taken to the same release point and they return to the same home loft, so therefore it is the fastest bird to complete the journey from A to B. One-loft racing is now becoming very popular all around the world with fanciers able to compare their bloodlines on an equal basis against the many other pigeons. Racing pigeons are housed together in a specially designed dovecote or loft. From about 4 weeks of age until the end of its racing career, the racing loft is the pigeon's home and is where it returns to on race day. After 22 to 28 days in the nest (depending on the owners preference) the young birds are removed and placed in a section of a large loft or in a smaller loft built for the purpose. After a few days of learning how to locate the water and eating by themselves they are allowed to wander out of the loft and peck around in the garden, while doing this they are constantly observing their surroundings and becoming familiar with them. At about age 6 to 7 weeks the birds will begin taking off, flying in very small circles around their loft and owners house. As their confidence grows they gradually wander farther and farther from home until they are out of sight and can remain so for as much as 2 hours before returning. When a few trainers fly their pigeons in the same area, these flying "Batches" (as flocks of pigeons are called) can number in the thousands. It does not, however, help them much in relation to finding their home from long distances away, a fundamental of pigeon racing. As confident flyers, the young pigeons are taken on progressively longer 'training tosses', driven a distance away from their home and released. This is like the format of a real race, however on a much smaller scale and it is usually not timed in the same way as a race. This practice of loft flying and tossing continues throughout a pigeon's career. Training methods are as varied as the pigeons themselves. Some fanciers believe their system is the secret to their success and guard these hard learned lessons closely. Most fanciers will explain their basic strategy but some may be reluctant to share the details of their success. One of the most popular systems is widowhood. This system uses the birds desire to reproduce as motivation to try to give the bird a sense of urgency on race day. The use of widowhood is usually begun by first allowing the racer to raise a baby in their nest box. After the baby is weaned the hen is removed and often the nestbox is closed off, from then on the only time these birds are allowed to see their mate or enter the nest box is upon returning from training or a race. This conditioning is one of the key elements in a lot of racing programs. Due to advancements in technology researchers have been able to use small Global Positioning Systems to track the flight paths that their birds follow. Jan Van Stalle, began using small GPS devices to document the flight patters of high flyers in 2009 and is expecting to publish a full report on the subject in early 2012. Small GPS systems have recently begun to hit the consumer market. Companies like PigeonTrack and GEM Supplements currently sell GPS units for novice to advanced race trainers to use to gather data. The peregrine falcon is a major predator of racing pigeons. As pigeon racing takes place over great distances in the sky, instead of on a racetrack, there are many hazards that could befall a pigeon during racing as well as training. The main hazard encountered by racing pigeons is predation by birds of prey. The killing of valuable pigeons by wild predators has led to some pigeon fanciers being suspected of killing birds of prey such as falcons. Another hazard that racing pigeons encounter is flying into objects they sometimes cannot see, mostly when flying at high speeds or in darker weather conditions. The most common obstruction are electricity pylons or TV aerials. Pigeon fanciers will often have one of their pigeons return home with wounds or missing feathers from the belly or flanks region. It is thought that racing pigeons rely on the Earth's magnetic field to find their way home. Some evidence has surfaced indicating that mobile phone towers may be interrupting the birds' navigation, although no published research has investigated this theory. A pair of young racing pigeons, 9 days old. Pigeons are sexually mature at about six months of age. However, fanciers will often wait until the pigeon is at least a few months older before breeding. The first egg is laid and not incubated until the clutch is complete, with eggs being laid every other day. A hen bird will usually only lay two eggs in a clutch. The incubation period is 17 days. Pigeon breeders are careful in selecting birds to pair together so as to continue improving the breed and gain a competitive edge. It is this selective breeding that has given rise to the racing pigeons of today, capable of finding their way home from over 1600 km away and flying at speeds in excess of 130 km/h with a tail wind but average 60 km/h on a calm day. Hens are often capable of laying upwards of 12 eggs per year, and squabs usually leave the nest at approximately 3–4 weeks of age. Doping in pigeon racing is the practice of giving performance-enhancing drugs to avian racers. The drugs are used to produce similar effects to those found in human athletes, building up muscle tissue and opening the respiratory tracts. In addition, corticosteroids can be used to delay moulting, allowing a bird to race late into a season. In October 2013, blood samples from twenty Belgian pigeons were sent by the Pigeon Fanciers Association to South Africa for testing. This was the result of an exchange visit by the association to the National Horseracing Authority of Southern Africa. While tests in Belgium had not found traces of any drugs the South African laboratory discovered that six samples contained unusual substances. Five samples were found to include traces of Mobistix, aka acetaminophen a widely used over-the-counter analgesic (pain reliever) and antipyretic (fever reducer). The sixth sample was erroneously reported in the press as having shown indications of cocaine use, but the lab reported that it was indications of caffeine usage. As the samples were sent anonymously no action could be taken against the owners of any of the birds. In 2001 a series of raids across 80 homes led to the confiscation of large quantities of illegal performance-enhancers. Currently, all race winners are tested and over 100 samples were collected and tested in 2013. In 1995 the Belgian Ministry of Health mandated drug testing in order to protect the welfare of the birds. The sport's governing body was looking at the possibility of implementing new anti-doping rules for the sport prior to the commencement of the 2014 season. A report commissioned by Scottish National Heritage and the Scottish Homing Union found that on average 56% of birds released each season do not make it home. In 1996 more than 34,000 birds were lost in Scotland and 8,000 returned injured. Pigeons may supply up to 80% by weight of the Peregrine Falcon's diet, especially when there are eyasses (babies) in the nest. Between 2010 and 2012, PETA conducted an investigation into the practices of pigeon racing in the US. It found that there were casualty rates of 60 percent or more among birds during races and training due to weather, predators, electrical lines, and hunters. Races where the majority of birds fail to return to their loft in race time are referred to as "smash races." At the 2011 American Racing Pigeon Union Convention, 827 out of the original 2,294 birds returned from training flights. On July 24, 2014, PETA released findings from a five-month-long investigation, conducted in 2013, alleging that Oklahoma City - based Continental Breeding Station, was involved in a multibillion-dollar gambling operation in Taiwan. The sport was introduced into the United States about 1875, although regular racing did not begin until 1878. The sport of pigeon racing is well established in the US, and growing. According to the American Racing Pigeon Union, one of two large accrediting groups, there are 15,000 registered lofts in the U.S. Although the sport is banned in Chicago, it was popular throughout the twentieth century in the New York area, particularly Hoboken, New Jersey and Coney Island, where it still has devotees. Shady Hills, Florida is home to a pigeon racing club and hosts an annual racing event. The sport of pigeon racing has increased in Canada with Pigeon Clubs and Ladies Auxiliary popping up in cities and towns. CRPU, the Canadian Racing Pigeon Union, is an organisation that is dedicated to the growth, preservation and support of pigeon racing in Canada. The "Brazilian Pigeon Racing Grandprix" is the biggest pigeon race in South America. The Sergipe's Pigeon Racing Association and the government from Aracaju City organise this event. Pigeon racing is becoming increasingly popular in parts of Asia, especially India, China, Pakistan, Iran, Philippines, Japan, Taiwan and Bangladesh. 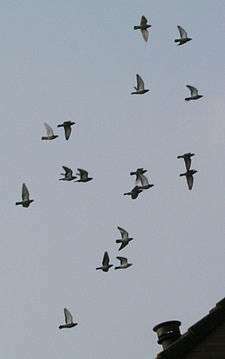 In Bangladesh there are three pigeon racing associations which are looking after the sport and are organizing many races. There are thousands of registered pigeon fanciers in Bangladesh and more people are getting involved in this sport. In India the sport is governed by the Indian Racing Pigeon Association. The mecca of the sport in India is Chennai, the capital city of the state of Tamil Nadu. The sport in India has come a long way under Shri Ivan Phillips the president of the Indian Racing Pigeon Association, widely known as the father of Pigeon Racing in India. Taiwan has more racing pigeon events than any other country in the world, and can point to between 2 and 3 million birds. Nearly 500,000 people race pigeons on the island, and each year, prize money for races reaches the billions of NT dollars. The largest racing organisation in Australia is the Central Cumberland Federation. The state of Queensland also has a number of clubs and organisations. The biggest of these is the Qld Racing Pigeon Federation Inc (QRPF). Located in Brisbane, the QRPF has a long history dating back to the Second World War. Each year the QRPF organises pigeon races for its some 80 members. These races start at approximately 145 km in distance and continue on a gradual basis out to distances of over 1000 km. A specialised transporter is used to transport the birds to the release points. 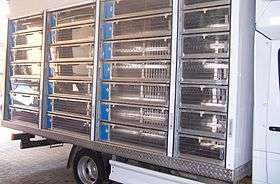 This transporter enables the birds to be fed and watered on route before mass release at a predetermined time for their flight back to various home lofts. Many thousands of pigeons compete in races each weekend during the winter months. An innovative new one-loft race is the Australian Pigeon Punt Race held in Victoria, Australia. The sport of pigeon racing has been declining around Sydney with pigeon club members gradually dying off as fewer younger people take up the sport. The high cost of feeds and fuel have also contributed to the decline. The first regular race in Great Britain was in 1881. The British Royal Family first became involved with pigeon racing in 1886 when King Leopold II of Belgium gave them breeding stock. The tradition continues to this day, with a bird of Queen Elizabeth II even winning a race in 1990. The sport is declining in the UK with membership of recognised clubs and federations falling by about five per cent annually. The National Flying Club is a British pigeon racing club, and open to anyone in England and Wales. In the United Kingdom and Ireland pigeon racing is regulated by 6 independent organisations. In 2007 the British Parliament banned pigeons racing from the mainland of continental Europe to Britain because of the risk of bird flu. A British MP is supporting fanciers to have the ban lifted. Labour's MEP Brian Simpson, from Golborne, believes that it is unfair to allow concerns about avian flu to throttle the fanciers' sport. Mr Simpson said, "But what is clearly apparent now is that pigeon are low-risk in regards to avian flu and the decision to ban continental pigeon racing was wrong." The Janssen Brothers (Louis, Charel, Arjaan and Sjef) are a famous and very successful pigeon racing family from Arendonk, Belgium. Louis Janssen, born 1912, was the last of the famous brothers. He died April 16, 2013, at the age of 100. Descendants of the brothers pigeons can be found racing all around the world. Another famous and successful pigeon fancier is Karel Meulemans. Karel, born in Retie, also lives in Arendonk. As often occurs in smaller communities there is much competition between the families Meulemans and Janssen. Pigeon racing in Romania is one of Europe's hot spots in the sport. Many pigeon breeders join the National Federations every year, triggering more and more competitive challenges. Another aspect is the image that has changed in the last decade in regards of pigeon racing, since nowadays it stands for a fine art within the country, with symbolic prizes and bets. A high collaboration with pigeon fanciers from Belgium, the Netherlands and Germany is also observed. The sport is popular in Turkey. In May 2008 a nine part, 1,150-kilometer pigeon race from the town of Manisa to Erzurum was organised with participants from many pigeon associations across the country. South Africa is the home of the richest one-loft race in the world, the Million Dollar Pigeon Race. The Million Dollar Pigeon Race pits 4,300 birds from 25 countries against each other for a share of $1.3m in prize money. The runners-up win cars and smaller monetary prizes, while the overall winner can expect to pocket US$200,000. Sun City's one-loft race, sees birds from across the world air-freighted to South Africa as squabs, months before the race, and trained to orient to a single loft. Then on race day, after being released 550 km out on the South African veldt, the birds all race back to the same destination. The first race was in 1996 and attracted 893 pigeons. The race broke even after five years. ↑ Levi, Wendell (1977). The Pigeon. Sumter, South Carolina: Levi Publishing Co, Inc. p. 4. ISBN 0-85390-013-2. ↑ Levi, Wendell (1977). The Pigeon. Sumter, South Carolina: Levi Publishing Co, Inc. p. 40. ISBN 0-85390-013-2. ↑ Pigeon hypersensitivity pneumonitis: immunohistochemical demonstration of the causative antigen in the lung. ↑ Levi, Wendell (1977). The Pigeon. Sumter, South Carolina: Levi Publishing Co, Inc. ISBN 0-85390-013-2. ↑ Walcott, Charles (1996). "Pigeon Homing: Observations, Experiments and Confusions" (PDF). Journal of Experimental Biology. 199 (1): 21–27. ↑ Capital Times, Madison, WI. Sunday Nov. 23, 1941. pg. 11. ↑ Simmons, Morgan. "For racing pigeons, there's no place like home" (Web article). Knox news. Retrieved 2008-02-25. ↑ "Racing Pigeons Race Day". Canadian Racing Pigeon Union Inc. Archived from the original (Web article) on 2008-01-16. Retrieved 2008-02-19. ↑ Leader, Rhondda. "Fanciers get a real buzz from racing" (Web article). icWales. Retrieved 2008-02-19. ↑ "Pigeon racing: Lawrence's big passion" (Web article). Oxford Mail. Retrieved 2008-02-25. ↑ "Birds of Pray . . .The Peregrine Falcons of St Mary's Cathedral, Kilkenny" (Web article). Kilkenny People, 18 Jan 2012. Retrieved 2012-05-01. 1 2 3 Carreyrou, John (12 November 2004). "Doping scandal hits pigeon racing". Wall Street Journal. Retrieved 26 October 2013 – via Ergonomics.com. ↑ "Racing pigeons in Belgium flying high on coke, painkillers". Telegraph. 25 October 2013. Retrieved 26 October 2013. ↑ Martens, Martin (7 July 2013). "Het dopingdossier van de KBDB blijft de tongen beroeren". PIPA. Retrieved 6 October 2014. 1 2 Gallagher, Paul (25 October 2013). "World of pigeon racing rocked by doping scandal". Independent. Retrieved 26 October 2013. ↑ Pearson, Harry (6 February 2009). "Stone the crows, and other tales of bird doping". Guardian. Retrieved 28 October 2013. ↑ Ratcliffe, Derek (2010). 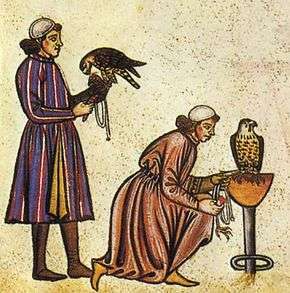 The Peregrine Falcon. Calton, Staffordshire, UK: Poyser. p. 125. ISBN 978-1-408-13684-3. ↑ Paddock, Barry (2012-04-29). "Pigeon racing a multimillion, illegal enterprise" (Web article). New York Daily News. Retrieved 2012-05-01. ↑ "Lou Bernardone" (Web article). New York Daily News. Retrieved 2012-05-01. ↑ Hinchey, Kyle (27 July 2014). "Oklahoma City pigeon breeder named in PETA gambling investigation in Taiwan". NewsOK.com. Retrieved 6 October 2014. ↑ Steeves, Heather. "Look Homeward". The Elsworth American (May 29, 2008). Retrieved 2008-06-24. ↑ Yaffa, Joshua (2007-12-09). "Look Homeward, Angels". The New York Times. ↑ Jensen, Erik (2008-03-08). "Flight of the old breed" (Web article). Sydney Morning Herald. Retrieved 2008-03-11. ↑ "Pigeon-Flying" (Web article). Classic Encyclopedia. Retrieved 2008-02-19. ↑ "A sport's race to survive" (Web news). Yorkshire Post. Retrieved 2008-06-19. 1 2 3 "MP fights over pigeon flights" (Web news). Wigan Today. Retrieved 2008-06-13. ↑ "Messenger pigeons fly in Turkish race" (Web article). Today's Zaman. Retrieved 2008-05-07. ↑ Bell, Dan (2008-02-01). "Flight of fancy" (Web article). BBC News. Retrieved 2008-02-13. ↑ Samuels, David. "The Arc of the Sun". The Atavist Magazine. Atavist. Retrieved 16 November 2016.